Supra Alloys is a fully stocked titanium service center located in Camarillo, California, about 50 miles northwest of Los Angeles. Our special metal products are routinely supplied for titanium applications in the aerospace, medical, sport and recreation, pulp and paper, chemical processing, and metal finishing industries. We stock a variety of commercially pure grades and titanium alloys in coil, sheet, plate, rod, bar, wire, and tubing forms. Our website is also a great resource for titanium specifications and practical information on working with this light, strong metal. Titanium can be economically machined on a routine production basis if shop procedures are set up to allow for the physical characteristics common to the metal. 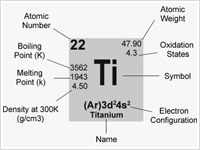 The factors which must be given consideration are not complex, but they are vital to successful handling of titanium.... 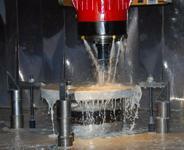 Learn more about Machining Titanium. As a leading titanium distributor for the most demanding U.S. industries, Supra Alloys has established its name by offering top quality metal products with unequaled customer service. As masters of their craft, Supra Alloys can prepare an order quicker and more economically than competitors, and always to the highest of standards, offering the best titanium quotes in the industry. This titanium supplier is dedicated to meeting the customer’s needs and exceeding their expectations. Supra Alloys is grounded in a tradition of excellence, while constantly adapting to new technologies and uses for titanium. The key to success has been the consistent dedication to our valued customers and the ability to evolve with modern titanium technologies. All metal products from Supra Alloys must pass our strict quality assurance plan. Our warehouse is full with every size and shape of titanium rod, bar, and wire, titanium tubing, and titanium sheet and plate. The company is already ISO 9001:2008 and AS 9100D certified and our titanium standards meet ANSI / NCSL Z540-I-1994 calibration requirements. We are happy to announce that Supra Alloys is also now ISO 13485:2016 certified for Medical Devices. Serving the United States, Supra Alloys is ready to exceed your expectations and supply you with the best quality and service in the titanium supply industry. Please contact us via our simple website form or at 1.888.647.8772 today for a price quote or to place your order.